Earlier this month we learned that more businesses have implemented a financial wellness program for their employees or are considering to do so in the near future. This trend is not too surprising since many recent measures of employees’ overall financial well-being are anything but encouraging. Just look at the new study from Bank of America Merrill Lynch which found that three in four surveyed working Americans said that they currently do not feel “very secure” financially, and 41 percent described themselves as being “not secure at all.” Moreover, employee respondents were found to be less confident in their ability to cover monthly housing expenses, basic necessities, and healthcare costs than when the same survey was conducted in 2013. 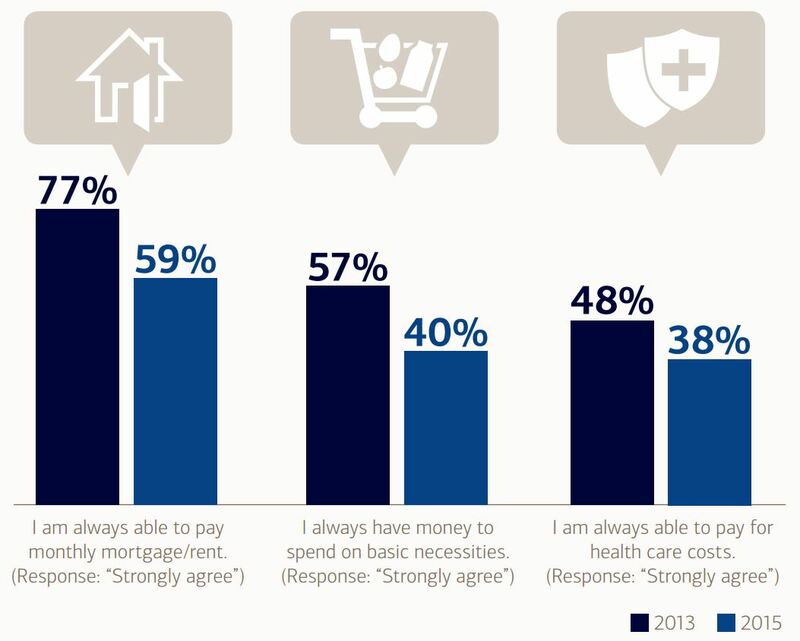 Such uncertainty about being able to handle near-term outlays is likely a big factor behind why 60 percent of surveyed workers said that they are “somewhat or very stressed” about their current financial situation. Seventy-seven percent of surveyed employees who said that they are experiencing an increase in healthcare costs reported that they are saving less for retirement as a result. Health savings accounts (HSAs) could help but only 29 percent of “not at all secure” respondents said that they have even considered using HSAs as long-term medical savings vehicles. Most alarming is that many surveyed workers may be underestimating how much money will need to be set aside for a comfortable and financially secure retirement. 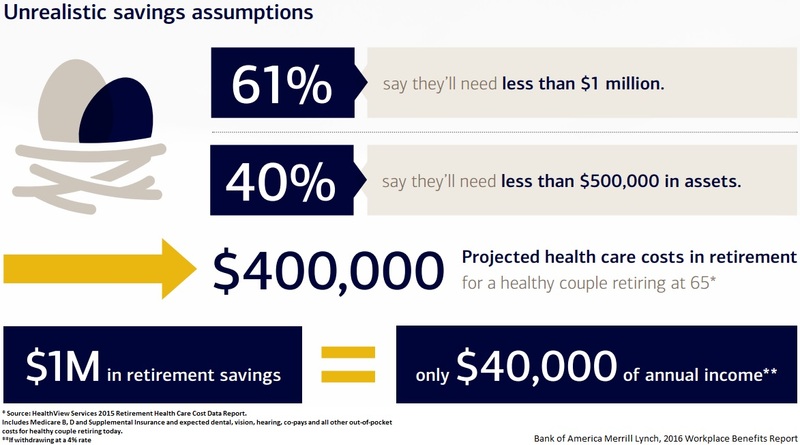 For example, 61 percent of respondents believe that they will need less than $1 million in retirement savings, and 40 percent feel that less than $500,000 should be sufficient (see above). However, planning clearly makes a difference because surveyed employees who reported being “very secure” financially were much more likely than “not at all secure” respondents to say that they understand how much money they will need to save for retirement, and that they currently have a strategy in place for managing and spending down their assets during retirement.